Dr. Warsof is a Professor and Director of Genetics & Prenatal Diagnosis Department of OB/GYN Division of Maternal Fetal Medicine, Eastern Virginia Medical School; and Ms. Valenti is a Genetic Counseling Supervisor, Department of OB/GYN Division of Maternal Fetal Medicine, Eastern Virginia Medical School, Norfolk, VA.
Down syndrome (DS) is the most common chromosomal abnormality, affecting 1:700 live births. Its frequency is at least a third greater if stillbirths and spontaneous losses, which inherently have a greater burden of aneuploidies, are included. With the aging of the obstetrical population the incidence has grown as high as 1:500 live births. Identifying pregnancies at risk for DS has been a major goal of prenatal care since safe prenatal diagnostic testing became available in the early 1970s. Experts have long recognized that DS occurs more frequently in older women (Table 1)3,4 and in women with a family history of DS. These two criteria (maternal age >35, and family history) were the traditional risk factors for offering diagnostic testing when amniocentesis and karyotyping became clinically available. Unfortunately, these criteria have proven to be poor screening tools for DS, exposing 15% to 20% of pregnant women to invasive testing, with its inherent pregnancy loss rate, while detecting only 30% to 35% of affected pregnancies. Recently, due to the results of large population-based studies in the United States and Europe, myriad new options have been introduced for Down syndrome risk assessment that can be done either in the first trimester or by combining first- and second-trimester measurements. This article presents options for fetal aneuploidy risk assessment during pregnancy. Second trimester risk assessment for aneuploidy primarily involves serum biochemical markers. The association between DS and low maternal serum alpha-fetoprotein (MSAFP) levels in the second trimester was recognized in 1984.5 This association was expanded in the late 1980s, when elevated levels of human chorionic gonadotropin (hCG) and decreased levels of unconjugated estriol were also reported in DS fetuses. Combining these three biochemical markers into what is currently known as the “Triple Screen” was shown to detect approximately 60% of DS fetuses for a 5% screen positive rate when offered to women between 15 and 22 weeks’ gestation.6 In the 1990s, Dimeric Inhibin A was shown to be increased in DS fetuses independently of the other biochemical analytes.7 By adding this fourth serum analyte to the Triple Screen, the “Quad Screen” enhanced detection of DS fetuses to 81% with a 5% screening false positive rate.8,9 These biochemical markers were also found to be effective in assessing risk for Trisomy 18. 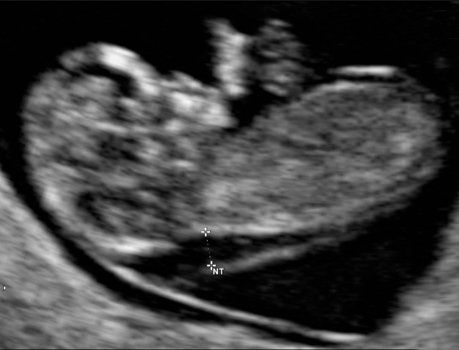 Fetuses with ultrasound-detected congenital anomalies show an increased risk for DS. Congenital heart disease, cystic hygroma, omphalocele, and duodenal atresia have the highest burden of aneuploidy, even though at least 50% of infants with DS have no recognizable major congenital anomalies. Therefore, many sonographic studies have been attempted to identify DS by unusual ultrasound features often referred to as markers. Frequently referred to as a “genetic sonogram,” identification of these markers will significantly alter the risk of DS, providing individual risk assessments for DS rather than age-specific risks. (Table 2).10-12 None of these markers should be considered diagnostic for DS. Similarly, the absence of these markers will reduce the risk of DS by approximately 50% to 80%, but it will not exclude the possibility of aneuploidy. To be useful NT measurements must be performed with accuracy and reproducibility. Errors of tenths of a millimeter can greatly alter calculated DS risk (Table 4). 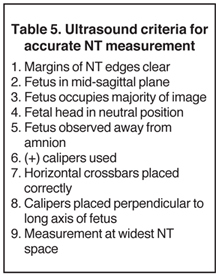 As a result, the Nuchal Translucency Quality Review (NTQR) in the U.S. and the Foundation for Maternal Fetal Medicine (FMFM) have developed strict criteria, specific credentialing, and quality review for NT measurements (Table 5). In clinical practice, the largest NT measurement that meets the criteria should be reported to the laboratories. The crown-rump length window for NT assessment is between 38 and 84 mm, which correlates between 10 and 13 weeks’ gestation. NT is also a marker of fetal congenital abnormalities, especially cardiac malformations. Due to the association of congenital heart disease with an NT greater than 3.4 mm, it is generally accepted practice to perform a detailed evaluation of the fetal heart in the second trimester. Aside from its effectiveness in screening for DS and other chromosomal abnormalities, first trimester risk assessment may provide many additional benefits. 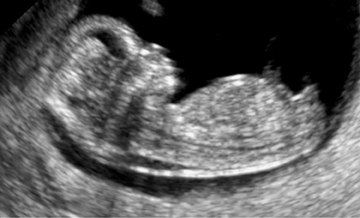 These include either establishment or confirmation of precise gestational age, early recognition and determination of chorionicity in multiple gestations, identification of many major congenital abnormalities—including cystic hygromas that are associated with an up-to-50% incidence of chromosomal anomalies. Additionally, studies show that, similar to abnormal values of second trimester serum markers, first trimester markers correlate with preterm delivery, preeclampsia, and fetal growth restriction. The most efficient screening test is one with the highest sensitivity (detection rate) with the lowest screening false positive rate. The most efficient screening for Down syndrome is achieved when both first trimester and second trimester markers are combined. The Fully Integrated Screening model involves measuring NT and PAPP-A between approximately 10 weeks and 6 days and 13 weeks and 6 days, followed by serum measurement of AFP, UE3, HCG and Inhibin at approximately 16 to 18 weeks’ gestation. A single risk assessment for DS is given at this time. Both the SURRUS and FASTER trials reported a 94% to 95% detection rate in DS with a 5% false-positive rate.8,9 While the detection rates are quite high, the disadvantage of fully integrated screening is that it leads only to a second trimester result. Women are not given results after the first part of their screening. Integrated screening would deny a patient the opportunity to pursue a first trimester diagnosis by chorionic villus sampling (CVS) with earlier and safer terminations if needed. 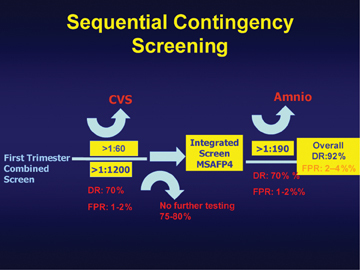 Using the Sequential Contingency Screening method, a patient would be given a risk after the first part of her screening. The risk would be classified as high, intermediate, or low. Women at high risk would be given the option to pursue a diagnostic test. Women at low risk would not need to pursue any further screening or testing. Only those with an intermediate risk would have the second trimester blood screening. An overall risk assessment employing both the first and second trimester screening would then be provided. The detection rate for DS with the Sequential Contingency Screening method is considered similar to that of the Fully Integrated Screening model. The SURUSS trial suggested that only 25% of patients who pursue Contingency Screening would need the second trimester part.8 In a meta-analysis,15 detection rates of > 90% were achieved with contingency screening, with only 15% requiring the second trimester portion. Although this strategy is already used in many patients, formal Contingency Screening is not clinically available. Investigations continue exploring additional ultrasound parameters for DS risk assessment,21 Recent studies have found that blood flow through the fetal Ductus Venosus 19,20, fetal tricuspid regurgitation, and the frontomaxillary facial angles22 are all promising. All of these techniques are unavailable for large-scale population screening and remain investigational at this time. Which is the best test? First trimester combined testing (NT plus serum analytes) gives the earliest results but leaves approximately 15% of DS cases undetected. The second trimester quad test and the genetic sonogram are appropriate for late registrants but leave 20% to 25% of DS cases undetected. The integrated test has the highest detection rates but leads only to a second trimester result, which may be unacceptable to many patients. 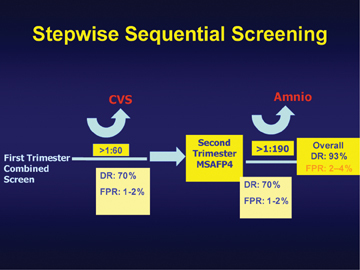 Stepwise Sequential testing detection rates are very close to the integrated test and allow women with very abnormal first trimester results to undergo early invasive testing, but it requires two tests. The contingency test may have slightly lower detection rates than stepwise sequential testing, but higher than first trimester combined testing alone, and it allows most women to complete screening after a single study early in pregnancy. Again, this testing is not currently clinically available. All studies that require first and second trimester results require significant administrative coordination. 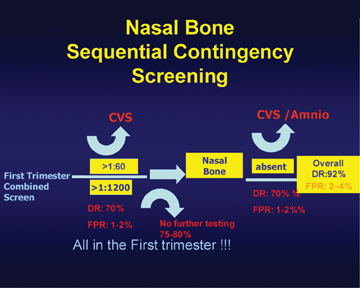 The nasal bone contingency test, which can be completed in 1 first-trimester visit, appears to have high detection rates and significantly reduced screen positive rates. This testing requires performance by an individual with expertise not only in NT measurement but also in nasal bone assessment. Additionally, the presence or absence of the fetal nasal bone varies with ethnicity. This form of screening requires further study. Some patient factors can direct the testing performed. Does the patient want the earliest test or the one that is least likely to falsely label her as being screen positive? Is her fear of losing a normal pregnancy greater than that of missing an aneuploidy? A single testing approach does not fit all situations. It must be emphasized that definite answers rely on a diagnostic test. All risk assessment strategies are designed only to determine the risk of a problem, and they will always have less than 100% sensitivity. As long as the only definitive way of diagnosing the karyotype of a fetus involves an invasive procedure that can cause the loss of a normal pregnancy, there simply is no substitute for explaining the options and their downsides to all patients. Patients will in turn be empowered to make decisions that are best for them and their pregnancy (Table 6). Shin M, Besser LM, Kucik JE, et al. Prevalence of Down syndrome among children and adolescents in 10 regions of the United States. Pediatrics. 2009;124:1565-1571. New Cronos Database: Demographic statistics. Eurostat. http://epp.eurostat.ec.europa.eu/portal/page/portal/population/data/database. Accessed February 7, 2012. Hecht CA, Hook EB. Rates of Down syndrome at live birth by one-year maternal age intervals in studies with apparent close to complete ascertainment in populations of European origin: A proposed revised rate schedule for use in genetic and prenatal screening. Am J Med Genet. 1996;62:376-385. Hook, EB. Chromosome abnormalities in older women by maternal age. Am J Med Genet.1990;35:184-187. Merkatz IR, Nitowsky HM, Macri JN, et al. An association between low MSAFP and fetal chromosomal abnormalities. Am J Obstet Gynecol. 1984;148:886-894. Wald NJ, Cuckle HS, Densem JW, et al. Maternal serum screening for Down’s syndrome in early pregnancy. Br Med J. 1988;297:883-897. Wald NJ, Densem JW, George L, et al. Prenatal screening for Down’s syndrome using Inhibin-A as a serum marker. Prenat Diag. 1996;16:143-153. Wald NJ, Rodeck C, Hackshaw AK, et al. First and second trimester antenatal serum screening for Down’s syndrome: The results of the SURUSS Study. J Med Screen. 2003;10:56-57. Malone FD, Canick JA, Ball RH, et al. First- and second-trimester evaluation of risk (FaSTER) research consortium. First-trimester or second-trimester screening, or both, for Down’s syndrome. N Eng J Med. 2005;353:2001-2011. Nyberg DA, Luthy DA, Resta RG, et al. Age-adjusted risk assessment for fetal Down’s syndrome during the second trimester: Description of the method and analysis of 142 cases. Ultrasound Obstet Gynecol. 1998;12:8-14. Smith-Bindman R, Hosmer W, Feldstein VA, et al. 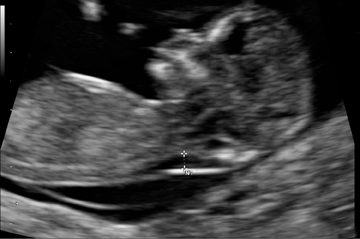 Second-trimester ultrasound to detect fetuses with Down syndrome: A meta-analysis. JAMA. 2001;285:1044-1055. Bromley B, Lieberman E, Shipp TD, et al. The genetic sonogram: A method of risk assessment for Down syndrome in the second trimester. J Ultrasound Med. 2002;21:1087-1096. Nicolaides KH, Spener K, Avgidou K, et al. 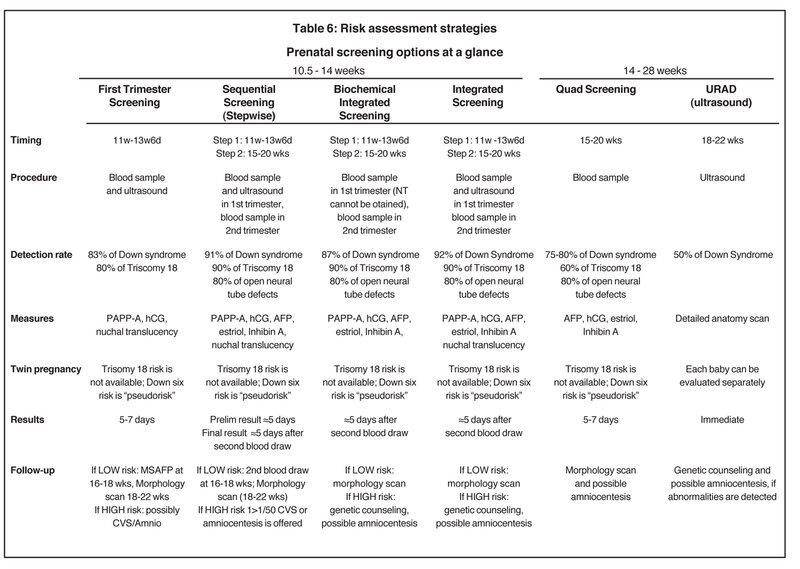 Multicenter study of the first trimester screening for trisomy 21 in 75,821 pregnancies. Ultrasound Obstet Gynecol. 2005;25:221-226. Wapner R, Thom E, Simpson JL, et al. First trimester maternal serum biochemistry and fetal nuchal translucency screening (BUN) study group. N Engl J Med. 2003;349:1405-1413. Cuckle HS, Malone FD, Wright D, et al. Contingent screening for Down syndrome-results from the FaSTER trial. Prenat Diagn. 2008;28:89-94. Cicero S, Sonek JD, McKenna DS, et al. Nasal bone hypoplasia in trisomy 21 at 15-22 weeks’ gestation. Ultrasound Obstet Gynecol. 2003;21:15-18. Cicero S, Rembouskos G, Vandecruys H, et al. Likelihood ratio for trisomy 21 in fetuses with absent nasal bone at the 11-14 week scan. Ultrasound Obstet Gynecol. 2004;23:218-223. Sonek JD, Cicero S, Neiger R, et al. 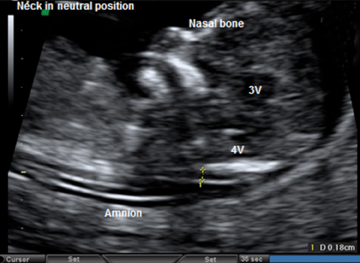 Nasal bone assessment in prenatal screening for trisomy 21. Am J Obstet Gynecol.. 2006; 195:1219-1230. Matias A, Gomes C, Flack N, et al. Screening for chromosomal abnormalities at 10-14 weeks: The role of the ductus venosus blood flow. Ultrasound Obstet Gynecol.1998;12:380-384. Antolin E, Comas C, Torrents M, et al. The role of ductus venosus blood flow assessment in screening for chromosomal abnormalities at 10-16 weeks of gestation. Ultrasound Obstet Gynecol. 2001;17:295-300. Falcon O, Faiola S, Huggon I, et al. Fetal tricuspid regurgitation at the 11+0 to 13+6 week scan: Association with chromosomal defects and reproducibility of the method. Ultrasound Obstet Gynecol. 2006;27:609-12. Sonek J, Borenstein M, Downing C, et. al. 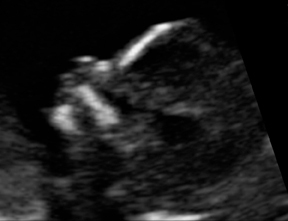 Frontomaxillary facial angles in screening for trisomy 21 at 14-23 weeks’ gestation. Am J Obstet Gynecol. 2007;197:160 e1-e5. First trimester risk assessment for Down syndrome. Appl Radiol.